Smaller markets account for the majority of top markets for real estate agents. One of the last recovery markets, Las Vegas appears to be on the rebound. Only five primary markets — Denver, Las Vegas, Nashville, Sacramento and Charlotte — were in the top 20. A grouping of midsized cities and two larger mountain-region metros are the best markets for real estate agents. According to a report from SmartAsset, Reno, Nevada; Lincoln, Nebraska; Denver; Salem, Oregon; and Peoria, Illinois, are the top five locales for agents. 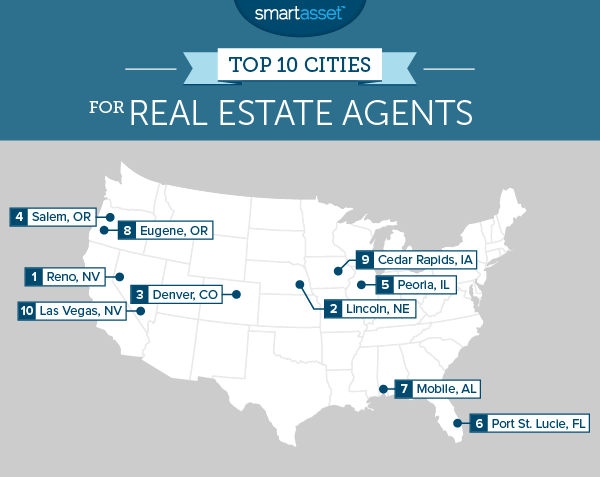 According to a report from SmartAsset, Reno, Lincoln, Denver, Salem and Peoria are the top 5 locales for agents. To determine the best markets, SmartAsset considered four different metrics — home turnover rate, change in median sales price, number of homes sold per agent and median agent salary. In total, 113 cities were studied. Looking at the top three markets, Reno claimed the No. 1 spot mainly because its median sales price jumped by 17.6 percent during the first quarter on a year-over-year basis. Because agents are typically paid a commission based on the value of the home, higher home values mean higher commissions for Reno-based brokers. Lincoln, Nebraska made its first appearance on the firm’s top 10 primarily because of its high turnover rate and high rate of appreciation (11.4 percent year-to-year growth). Nearly 6.5 percent of Lincoln’s housing inventory changed hands last year. Real estate agents in Denver earn a median income of more than $63,000 a year, the third-highest income. This, along with a 17.2 percent year-over-year rise in home prices, is why Denver is top of the list. Several of the nation’s largest cities — New York and Chicago — ranked among the top locations for agents in 2014, but fell out of the top 20 for 2015, with the exception of San Jose (12th).